Another “fair cold day;”* not an ideal time for the servant, Mary, to travel from North Easton to her home in Bridgewater. Whether she rode or walked, she must have been quite exposed and have become sick, for she didn’t return to the Ames household for the rest of the winter. She only reappears in Evelina’s diary the next July, working by that time for Alson and Henrietta Gilmore at their farm. What prompted her departure? Was she homesick for family in Bridgewater, or tired of working at the Ames’s house? Sewing was today’s occupation of choice for Evelina and her remaining servant, Jane McHanna. Evelina picked up an unfinished project from the previous spring, one that she had nearly finished with help from local dressmaker, Julia Mahoney. It was a “blue and orange deLaine,” meaning that it was a print or plaid, fine-weave, challis-like wool dress, one that would be of service in this cold weather. 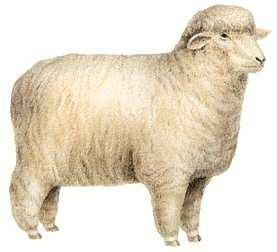 The wool itself came from a type of Merino sheep known as a Delaine (as in, “of wool” in French.) Jane, meanwhile, sewed some flannel underclothes for Evelina, who would be warmly dressed once these articles were finished. Next door, in the other part of the house, a man named Holman Johnson, probably visiting on shovel business, stayed the night.